Mix the beetroot juice and oil in a bowl, add the yeast. Combine the flour, salt, sugar and baking powder, mix in. Knead for approx. 10 mins. to form a soft, smooth dough, cover and leave to rise for approx. 1½ hrs. at room temperature. Roll out the dough to approx. 5 mm thick, cut out 12 circles (each approx. 8 cm in diameter) using a cutter. Brush the circles with a little oil, fold in the middle, place in the prepared basket, cover and leave to rise once again for approx. 30 mins. Mix the mushrooms with 2 tbsp of cornflour. Heat the oil in a non-stick frying pan. Sauté the mushrooms for approx. 5 mins., remove and set aside. Reduce the heat. Heat the sesame oil in the same pan. Sauté the garlic and ginger for approx. 3 mins., add the sugar, cook for approx. 2 mins. until the sugar begins to caramelize. Mix 1 tbsp of cornflour with the water, soy sauce, rice vinegar and Sriracha sauce, add to the pan, simmer for approx. 1 min. while stirring. Add the onion and mushrooms, heat through. Place a steamer basket in a wide pan, fill with water to just below the bottom of the basket. Cover the buns and steam over a medium heat for approx. 10 mins. 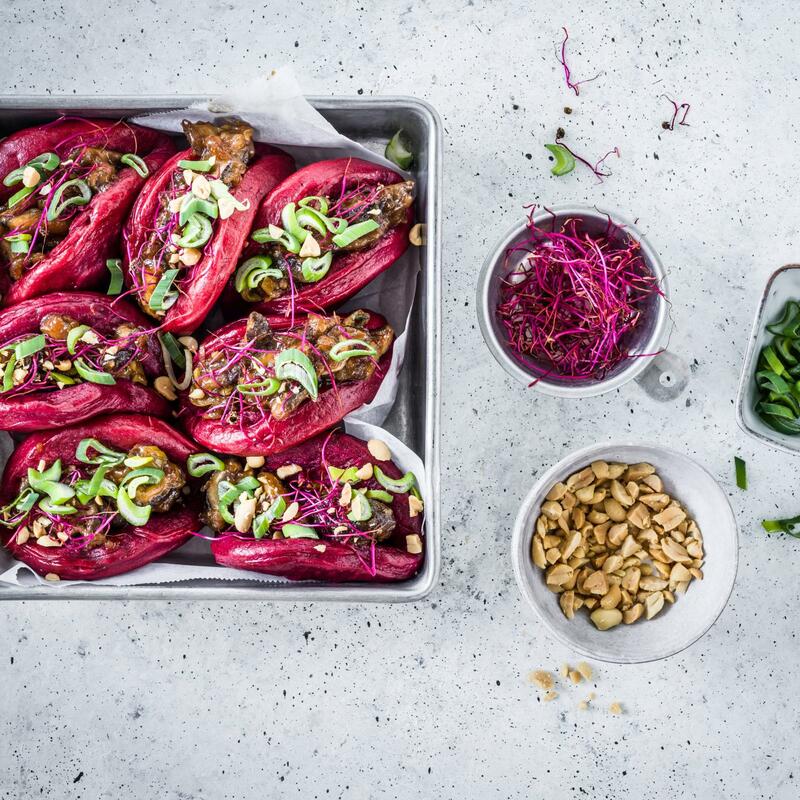 Spoon the mushroom filling into the bao buns, garnish with the beetroot shoots, peanuts and reserved onion greens.